To be honest, I don't have most of the other books that were suggested, but I DO happen to have a very nice copy of Kamandi #1 framed and hanging on the wall of my man-cave as one of the few permanent parts of my rotating cover gallery. I had bought it for that awesome cover, but except for a quick flip through before I put it on the wall, I never got around to reading it. . .Until now. Okay. . .first off, no matter WHAT I may think about the rest of this comic, that cover is SO damn good! Like I said, it's one of the few covers that don't rotate on and off my man-cave wall. Just LOOK at it! The colors, the composition, the water, the look of determination on Kamandi's face, the splashes of red to set everything off. . .everything about it is awesome. As far as I'm concerned, it's one of the greatest comic covers out there. But what's under that awesome cover, and is it any good? Untold Years ago, a catastrophic radioactive event called "The Great Disaster" wiped out nearly all mankind. Kamandi and his grandfather are the last of a group of survivors who occupied a military bunker called "Command - D", for which Kamandi is named. Kamandi has been educated through his childhood on the old world by a microfilm library. Kamandi ventures out into the world to see if it remains habitable and if there are any other humans left. As he rafts through the streets of what had been New York City, he finds it to be a strange world, nothing like the one Kamandi had seen in books and microfilm that survived the disaster. He discovers that humans still do exist, but they are more like wild animals. . .unable to talk and scared of him. Shortly afterward, he hears explosions from the bunker and races home to find out that armed, talking wolves have attacked and killed his grandfather. He manages to escape and kill the attackers, then decides there's nothing left for him and set out into the world driving the wolves' vehicle. Later, Kamandi comes upon a squad of armored Tiger-Men mounted on horses engaged in combat against a group of Leopard-Men. After killing a hidden Leopard sniper and saving the leader of the Tigers He finds himself caught in the middle of the conflict and is captured by the Tigers. The leader of the Tiger-Men, Great Ceasar, orders Kamandi to be taken to the Royal City as a prisoner. Kamandi escapes the kennels of the Royal City, where he was being kept with the more animal-like humans, but is recaptured and dressed in a ridiculous outfit in order to be presented to Great Ceasar as a pet. He watches a ceremony where he learns that the Tiger-Men of the Royal City worship a nuclear missile and once again escapes captivity, determined to explode the warhead and destroy himself and everything else rather than live as an enslaved pet. He is prevented from detonating the warhead by Doctor Canus, a Dog-Man scientist, who convinces Great Ceasar to give Kamandi to him for research. Inside Canus' private laboratory, Kamandi is introduced to Ben Boxer, another intelligent human, but one with strange nuclear powers. The issue ends with Kamandi being overwhelmed with emotion at realizing that he's not the last intelligent human on earth. I do have to say that Kamandi #1 is definitely better-written than Captain America #193. . .but that's not a very high bar to hurdle. I think I'm going to just go ahead and say that Jack Kirby is a comics legend for a good reason, and that reason is mostly his concepts and ideas. . .not his writing. So without trying to take away from Kirby's well-earned status, let's take an objective look at what's wrong with the story here. 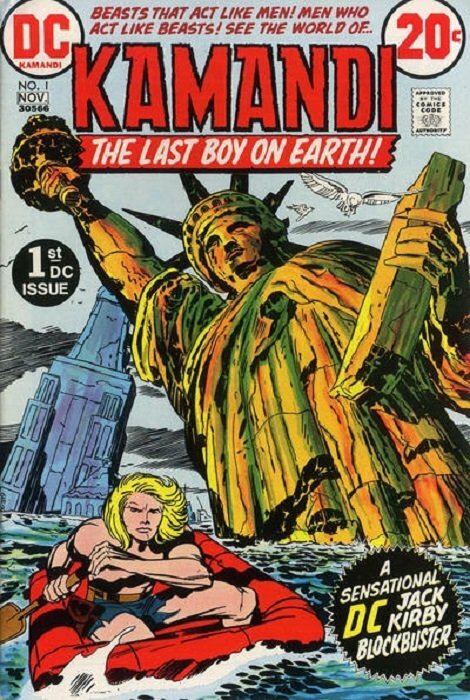 First off, Kamandi is. . .and I'll put it kindly. . .derivative of Planet of The Apes in a very big and very obvious way. The cover alone broadcasts the influence before you even go inside to see a post-apocalyptic world with intelligent animals ruling over mute, animalistic humans. Even beyond the broader strokes, Kamandi is captured and put into a cage with animal-like humans, is groomed as a pet, and is rescued when a doctor engaged in animal research realizes that there is something different about this particular human. It pretty much hits all the beats of Taylor's experience after being captured and sent to Ape City. I don't have other issues of Kamandi, so I can't speak to the derivative nature of anything after this one, but as far as THIS issue goes, it's a pretty obvious Planet of The Apes pastiche. "The next moment, all signs of their presence fades into silence! Kamandi has seen similar behavior in old wild life films. . .animal herds, fleeing a waterhole at the appearance of a predator!" Here's another example. . .
"The new pup doesn't look very happy, does he! Well, he'll soon perk up! Great Ceasar'll treat him better'n he treats us!" And those are just two examples! Every sentence in the issue is the same! They all end with exclamation points! No exceptions! None! It seems Jack Kirby REALLY liked exclamation points! The third main issue I have with the story is that, even though Kirby tried to somewhat disguise the obvious influence of Planet of The Apes by using other animals, the animals he DID use make the required suspension of belief almost impossible. Tigers and Leopards in North America? A tiger city in a cold northern climate? And why are the Tigers riding horses? It really seems like something a 14 year old would come up with for a Dungeons & Dragons campaign. I can hear Napoleon Dynamite's voice in my head when I think of it. . ."It's a tiger riding a horse!" There are a few other issues as well, but really they all boil down to the same exact problem that I pointed out in Captain America #193, and that is the writer also wearing the editor's hat. Sometimes it works, but it seems in Kirby's case it doesn't. It looks to me like Kirby needed the strong hand of an editor when it came to his writing. As far as the art goes, I have no complaints there. I've already gone on about the excellent cover being one of my favorite comic covers of all, and the interior art is equally impressive. I have to give credit to Kirby. His writing may be pretty weak, but he can take even the most ridiculous idea, like. . .say. . .a tiger wearing Roman armor riding a horse into battle in North America. . .and make it look GOOD. The double page spread of Kamandi rafting through the ruins of New York City in the first few pages of the comic are especially impressive, with a sense of massive scale, loneliness and impending adventure that is awe-inspiring in a way that is rarely seen in modern comics. There are plenty of other great moments through the issue as well. Kamandi #1 is a comic that has some problems. . .a highly derivative setting, ridiculous ideas, and a definite lack of editorial oversight. . .but I still found it enjoyable. It had great art from cover to cover, it had a likable main character, it wasn't boring at any point, and the ending held a lot of storytelling potential. Like I said above, I don't have any other issues of Kamandi besides this one, but hopefully, Kirby moved beyond the derivative nature of the first issue to expand on the potential to be found in the basic post apocalyptic concept of Kamandi. For me, as far as Kirby's work goes, I think I'll take the advice of someone's comment made when I was looking for good examples of Kirby's writing that pointed me in Kamandi's direction. . .I think from now on I'll just appreciate what there is instead of looking for things that aren't and leave it at that. Overall, it's not the greatest comic in the world, but it's not bad at all. If you're looking for a comic that's just plain old Bronze Age throwback FUN that you don't want to think too hard about, this is definitely worth a look. This was a nice little break, but back to Longbox Junk business as usual with the second half of Marvel's America. God help me. . .
Great review and assessment of Kirby and his work. I can't agree more with what you've said, and I love the Planet of the Apes comparisons. Keep up the great work! Same as above, great Apes correlation there. I haven't read any Kamandi books yet, but you have perked my interest with your review. Besides who could pass up some great Kirby artwork at the very least?